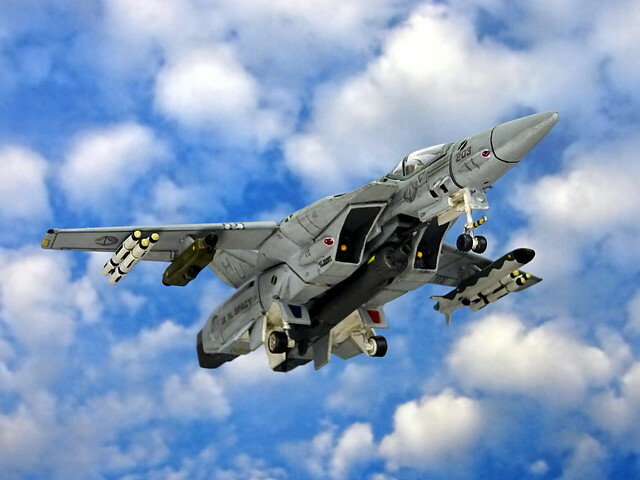 The VF-1 proved to be an extremely capable craft, successfully combating a variety of Zentraedi mecha even in most sorties, which saw UN Spacy forces significantly outnumbered. 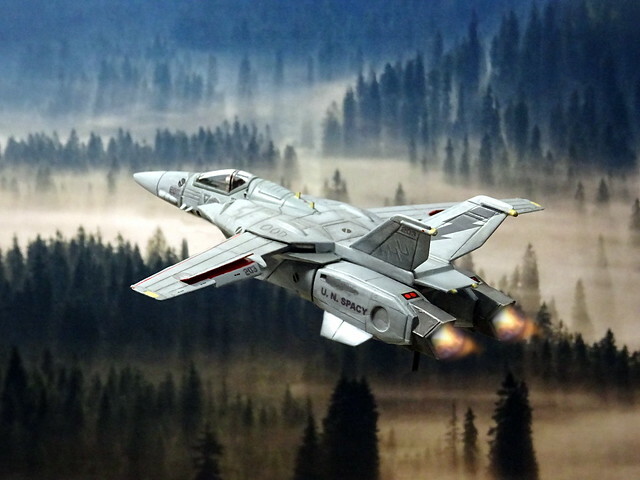 The versatility of the Valkyrie design enabled the variable fighter to act as both large-scale infantry and as air/space superiority fighter. 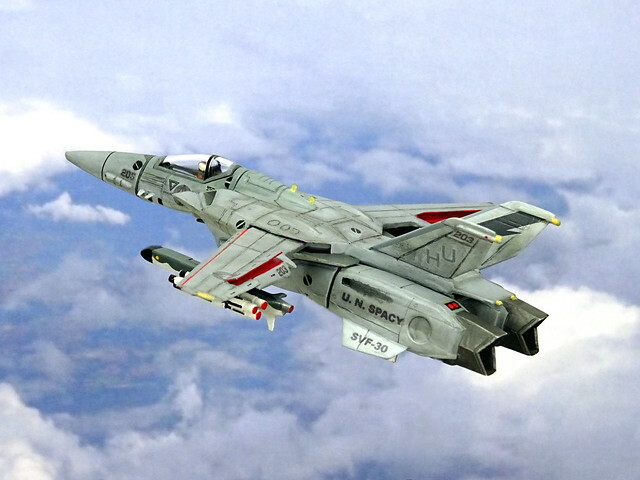 The signature skills of U.N. Spacy ace pilot Maximilian Jenius exemplified the effectiveness of the variable systems as he near-constantly transformed the Valkyrie in battle to seize advantages of each mode as combat conditions changed from moment to moment. 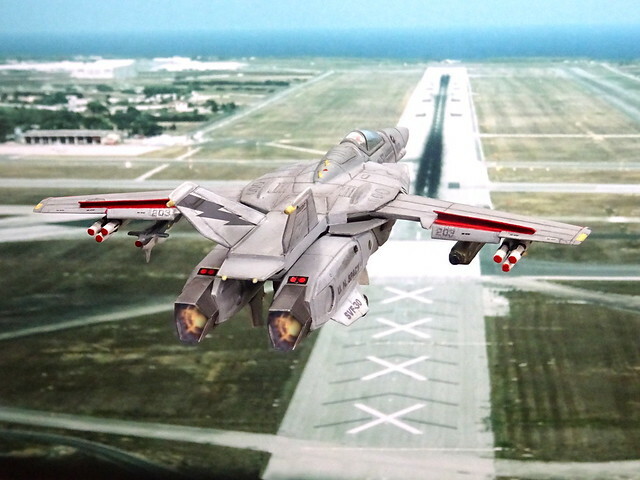 The basic VF-1 was deployed in four minor variants (designated A, D, J, and S) and its success was increased by continued development of various enhancements including the GBP-1S "Armored" Valkyrie, FAST Pack "Super" Valkyrie and the additional RÖ-X2 heavy cannon pack weapon system for the VF-1S for additional firepower. 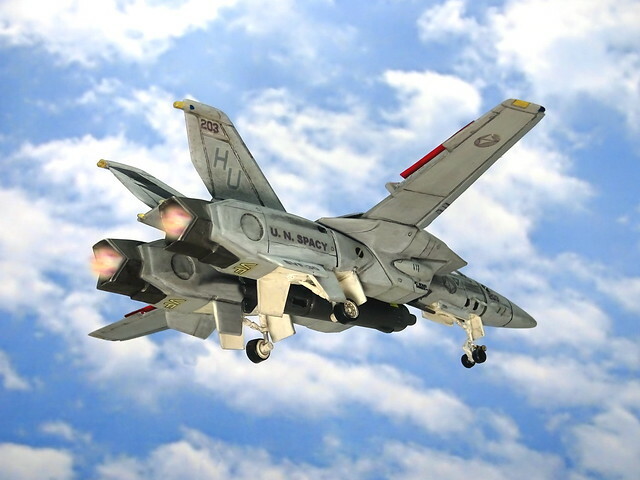 The FAST Pack system was designed to enhance the VF-1 Valkyrie variable fighter, and the initial V1.0 came in the form of conformal pallets that could be attached to the fighter’s leg flanks for additional fuel – primarily for Long Range Interdiction tasks in atmospheric environment. Later FAST Packs were designed for space operations. 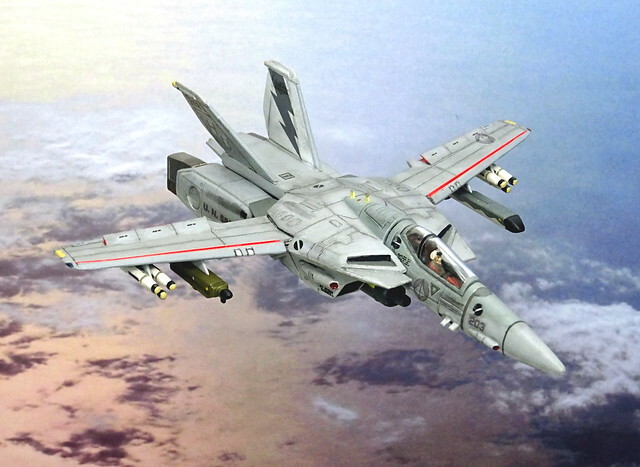 After the end of Space War I, the VF-1 continued to be manufactured both in the Sol system and throughout the UNG space colonies. 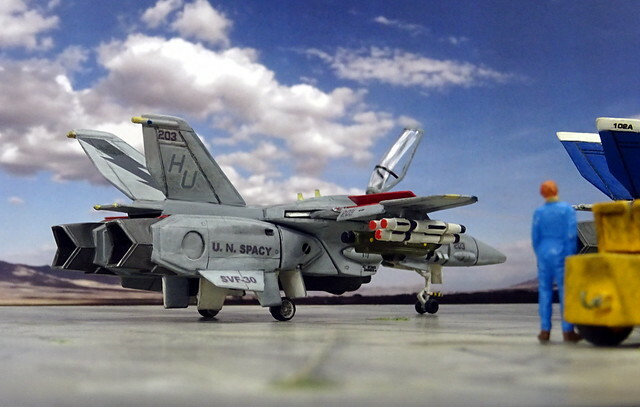 Although the VF-1 would be replaced in 2020 as the primary Variable Fighter of the U.N. Spacy by the more capable, but also much bigger, VF-4 Lightning III, a long service record and continued production after the war proved the lasting worth of the design. 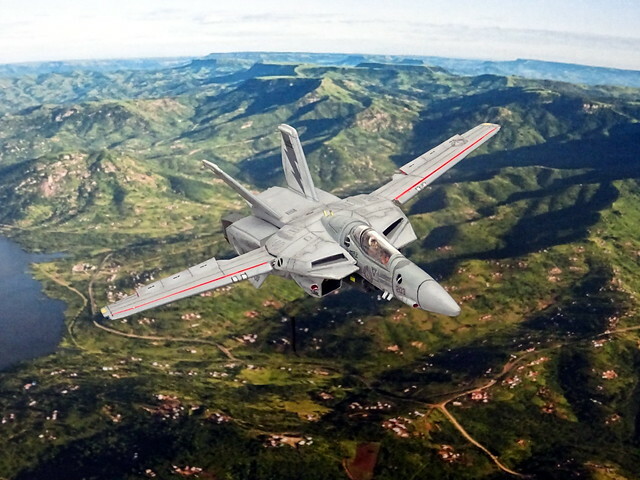 The versatile aircraft also underwent constant upgrade programs, leading to improved versions like the VF-1N and P. For instance, about a third of all VF-1 Valkyries were upgraded with Infrared Search and Track (IRST) systems from 2016 onwards. Many Valkyries also received improved radar warning systems, with receivers, depending on the systems, mounted on the wing-tips, on the fins and/or on the LERXs. Improved ECM measures were also mounted on some machines, typically in conformal fairings on the flanks of the legs/engine pods. 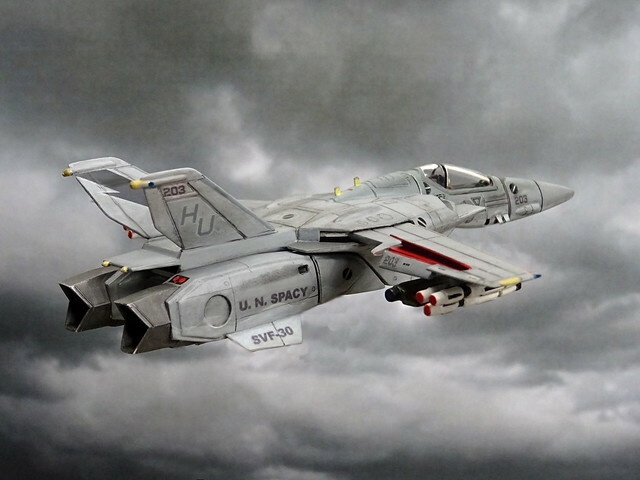 The VF-1 was without doubt the most recognizable variable fighter of Space War I and was seen as a vibrant symbol of the U.N. Spacy even into the first year of the New Era 0001 in 2013. 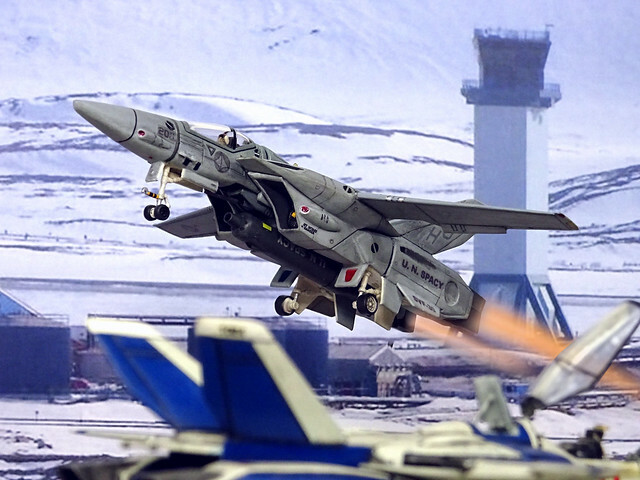 At the end of 2015 the final rollout of the VF-1 was celebrated at a special ceremony, commemorating this most famous of variable fighters. 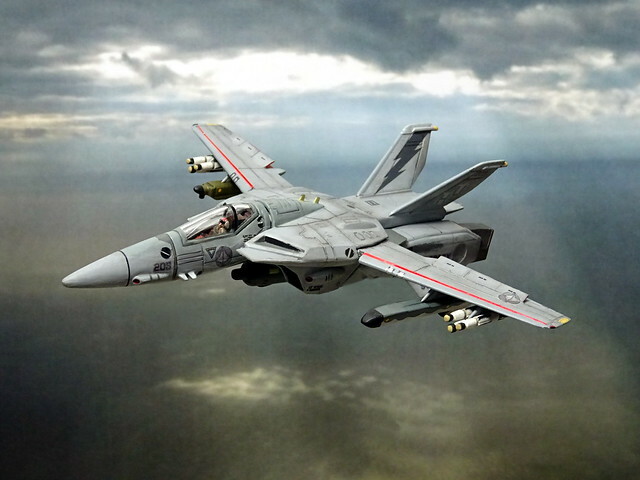 The VF-1 Valkryie was built from 2006 to 2013 with a total production of 5,459 VF-1 variable fighters in several variants. 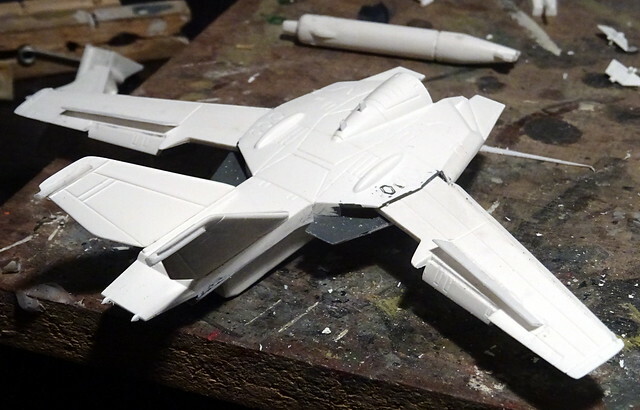 Another spontaneous interim build in a busy time - if I want to build something "on autopilot", an ARII VF-1 in fighter mode is a safe bet. 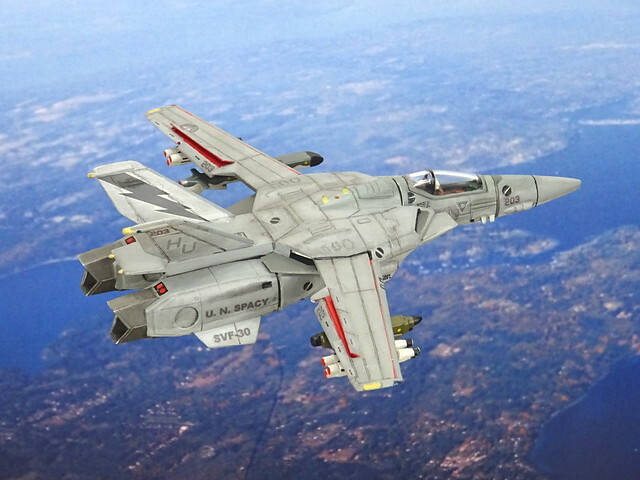 The trigger was that I realized that I had, despite having built far more than twenty VF-1s so far, none of them carried a US Navy "low viz" paint scheme? 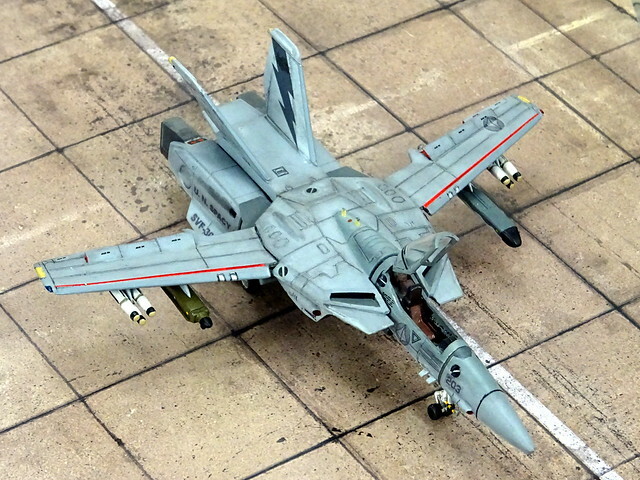 No idea why this had slipped my attention - even though I had already built one in a USAF "Egypt One" scheme and a modified (non-transformable) VF-1D in a low contrast Keith Ferris splinter scheme with USN colors. 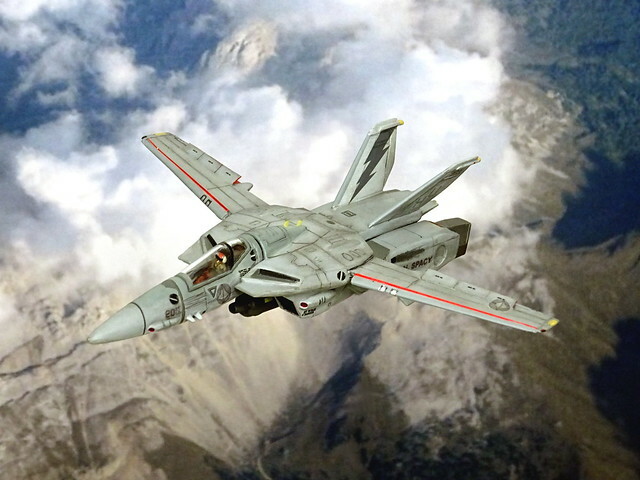 I dug out VF-1 fighter from the pile and built the kit mostly OOB - but with some detail updates. 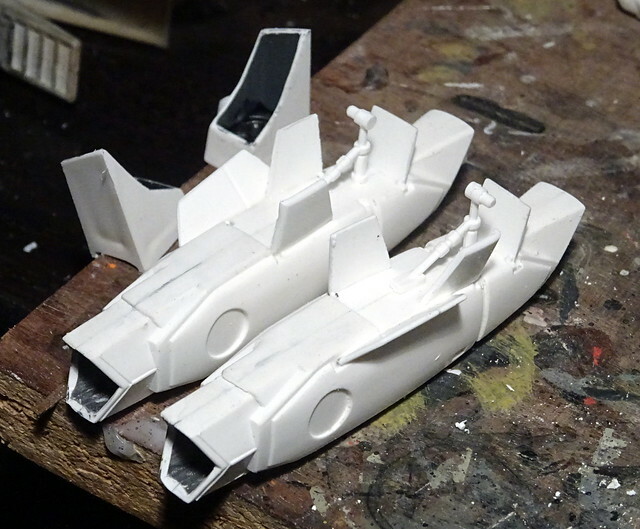 This time, the kit would receive an extended landing gear and an open canopy for ground display. Consequently, I added side consoles and a dashboard extension to the cockpit. 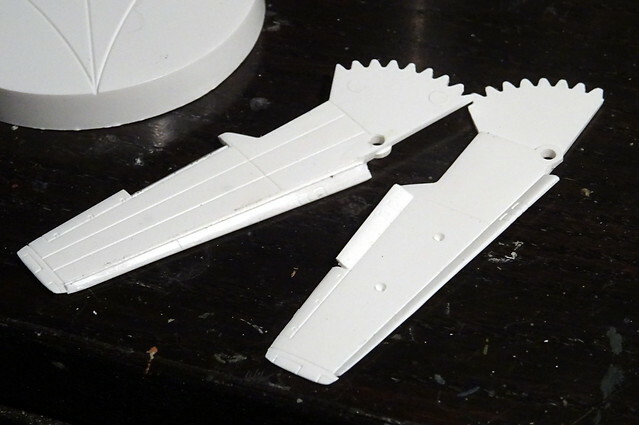 On the wings, the slats and the flaps were lowered, but not extended, and for additional excitement I opened the spoilers on the wings - because their red interior would be a nice contrast to the overall grey aircraft (see below). 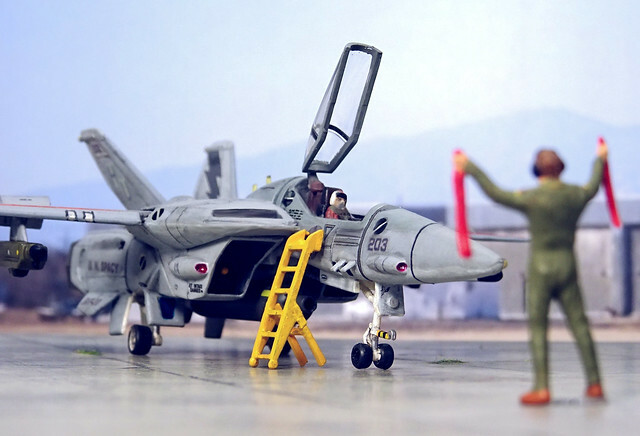 Characteristic blade antennae were added to the nose flanks and on the spine, and the pilot figure was only added for the beauty pics. 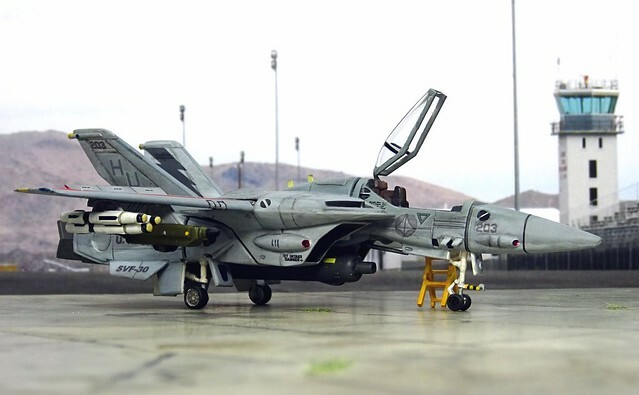 The ordnance was in part taken OOB, too, with six AMM-1 missiles on the outer pylons but an 1:100 AN/ALQ-131 ECM pod (from a Revell 1:100 A-10) and a single stand-off missile (an 1:144 AGM-86 ALCM, left over from an Academy B-1B kit, just mounted upside down) on the inner pair of pylons. 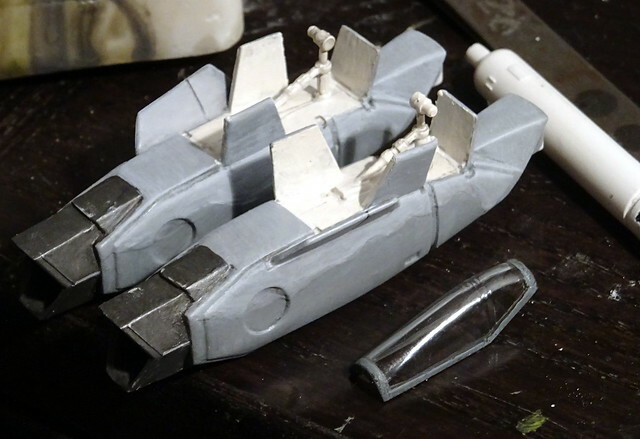 Even though the model would later stand on its own legs, I added the option to attach a display (my almost-patented wire construction that uses the OOB display base) to the back of the ventral gun pod. 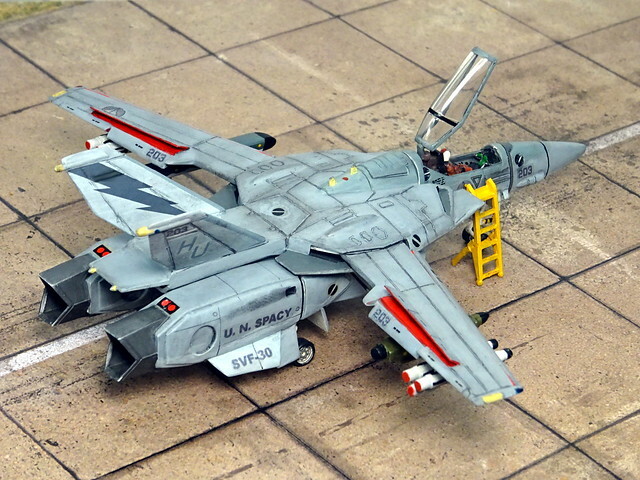 I am not certain if the "Compass Ghost" paint scheme is actually canonical for the Macross universe - Hasegawa offered such a "low viz" VF-1 as an option in one of their fighter kits, but I haven't found any sign of a USN paint scheme in official source material, except for some all light-grey Battroids that do not look like a "Compass Ghost" aircraft/mecha. 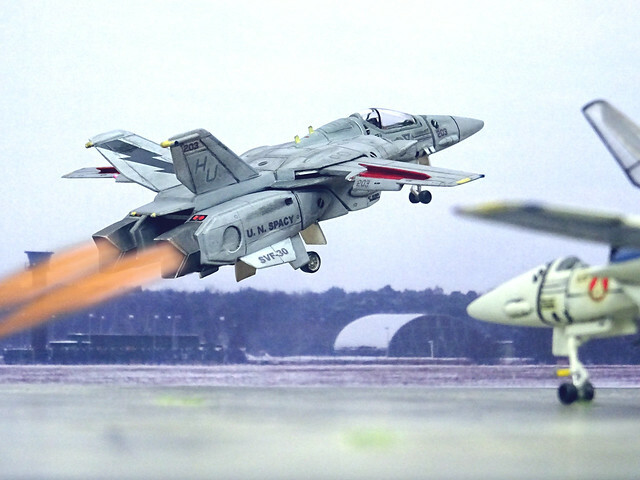 After 2009, many VF-1s were officially painted in a low-viz scheme - but this would rather be an overall FS 36440 (Light Gull Grey) livery with full color markings than a totally subdued multi-grey paint scheme? However, I found the idea plausible, and also took it as a challenge. 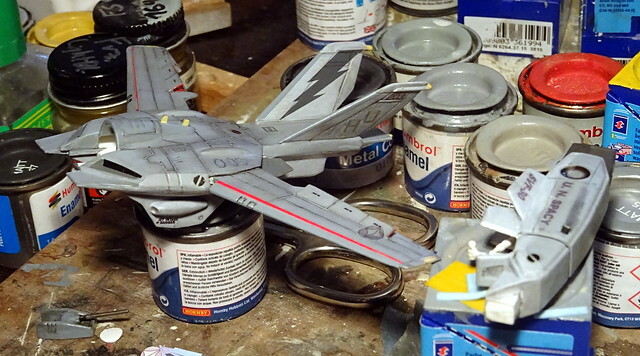 Consequently, the aircraft was painted in typical USN colors: FS 36320 (Dark Compass Ghost Grey) from Modelmaster on the upper surfaces and FS 36375 (Light Compass Ghost Grey, Humbrol 127) from below. 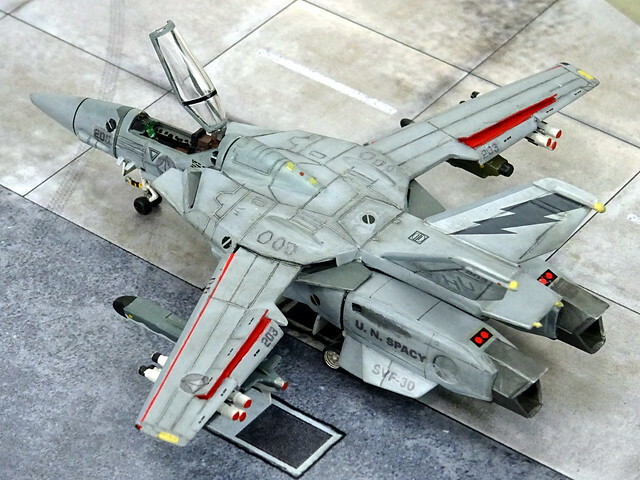 The area around the cockpit was painted with FS 35237 (Grey Blue, Humbrol 145), inspired by USN F-14 Tomcats, as well as the head unit. 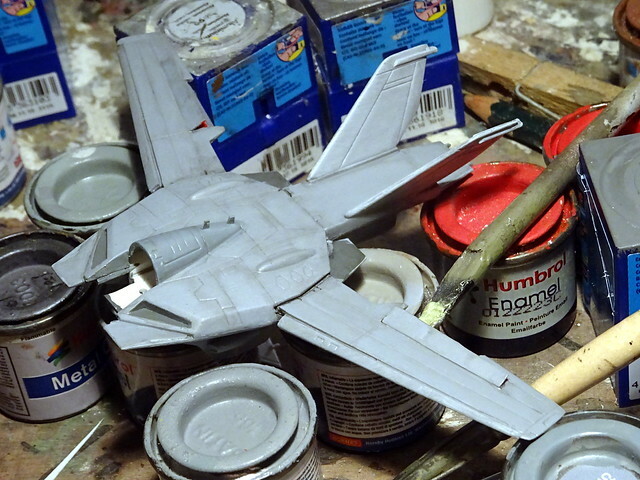 Air intakes, the gun pod and some details were painted with Revell 77 (RAL 7012), the land gear was painted glossy white. The cockpit was held in standard colors, with medium gray interior, a black ejection seat and reddish brown upholstery and brown "black boxes". 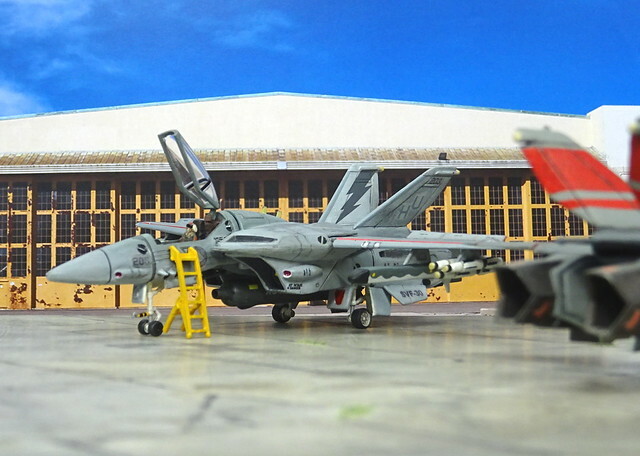 As a stark contrast to the all-grey exterior, I painted the interior of the spoilers on the wings in bright red (Revell 330, RAL 3000 Feuerrot) and added thin red decal strips to the lowered slats, too. Many markings like the roundels and the modex' were designed and printed on clear decal sheet with an inkjet printer, and any other bright marking was replaced with grey alternatives from the decal scrap box. 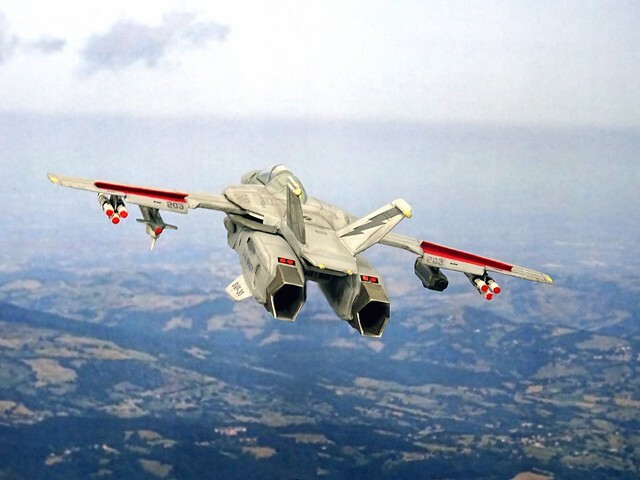 The lightning markings on the fins come belong to a Malaysian MiG-29, taken from a Begemot sheet. All in all I wanted a very "dry" and subdued look, with only the ordnance not being light bluish grey. 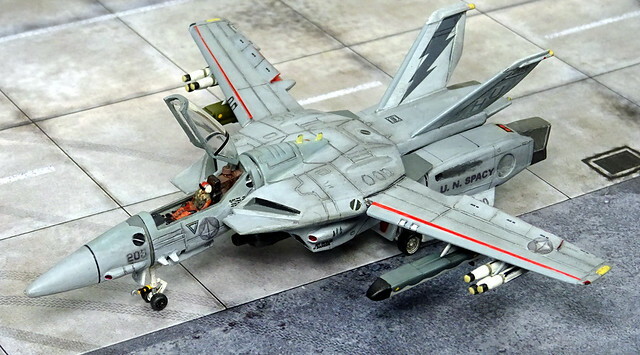 Once painted the kit received a light black ink wash and the engraved panel lines were traced with a very soft pencil, with some additional thin panel lines and details. Finally, the kit was sealed with matt acrylic varnish (Italeri). 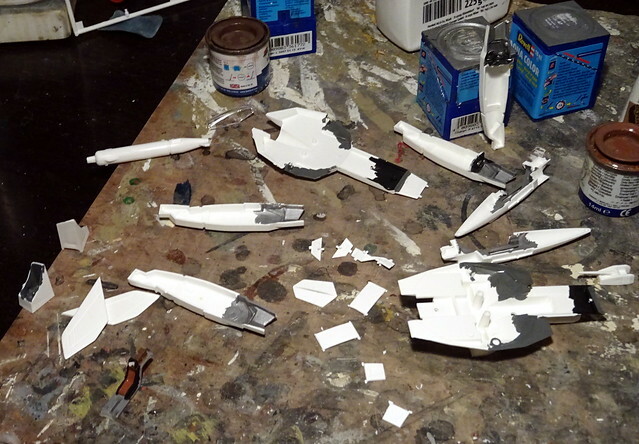 I guess that I might be able to build this kit blindfolded, and the whole affair was completed in just three days, since the paint scheme itself was not complex. 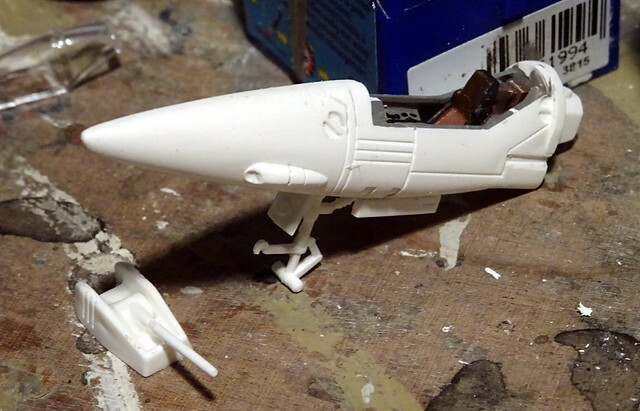 The result is interesting, though, and a nice contrast to the normally very bright and colorful VF-1s in my collection. 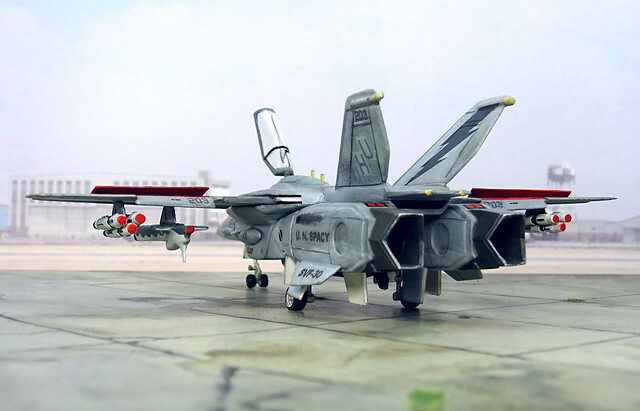 Always liked the look of these birds and definitely look better in a more realistic scheme.